They were always relieving themselves on my deck — the railing and floor. Sometimes they would vomit carcasses onto my deck. I found an entire dead crab there once. My brilliant neighbors fed them. At first they didn’t know what to feed them, so they called an ornithologist to get advice. He advised raw meat. Sometimes I found raw meat on my deck. I taped nails on top of my deck railing to keep them from standing there, but they just sort of stood around the nails. They have orange eyes and their feathers are greasy. Woman: Did you see those birds? Me: Yes. I got a bunch of them at my house at home and I hate them. 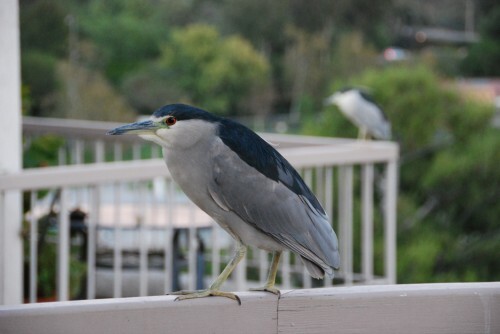 Woman: Well I think it would be neat to live somewhere that has herons. Where do you live? Me: California — Mission Viejo. You? Woman: Uh — Lake Forest. 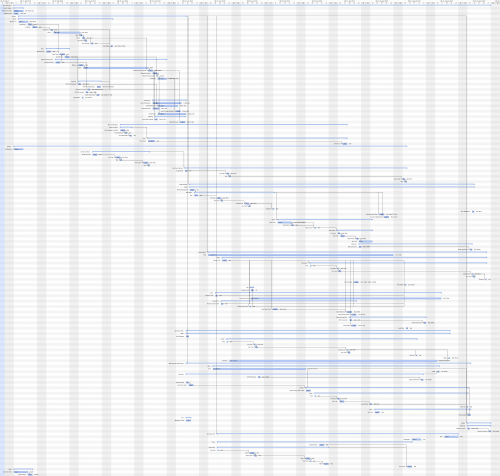 Spent about a day doing this, figure someone besides myself should get the *rich opportunity* to look at it. ‘Course I’m not so worried about being project manager as I am about being project team. House is supposed to close on the 30th. Hopefully it’ll be a fun summer. There’s not an immediate Plan B if I don’t get the house I posted about yesterday. I mean, Plan B is to wait around and see if any similar REOs come up in the next several weeks probably. And if not, then punt and just buy best-available whatever. Horrifying salt box in West View that needed, at a minimum, a new everything. Most particularly a new smell. 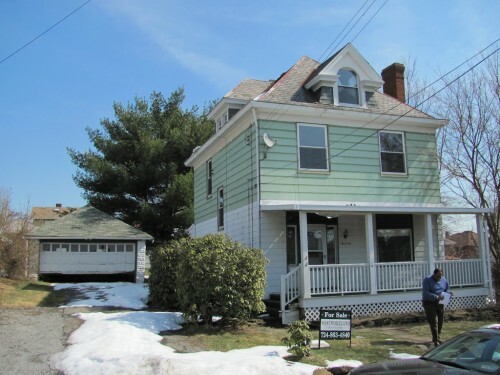 Kind of interesting big, old three-story house in West View that had a cool yard, a slight slant to the floor in the living room, a two-car garage, and probably required more time and money than I was gonna give it. Frightening three-bedroom in Morningside where you couldn’t really walk around for all the cobwebs and stuff piled on the floor (and on all other flat spaces). 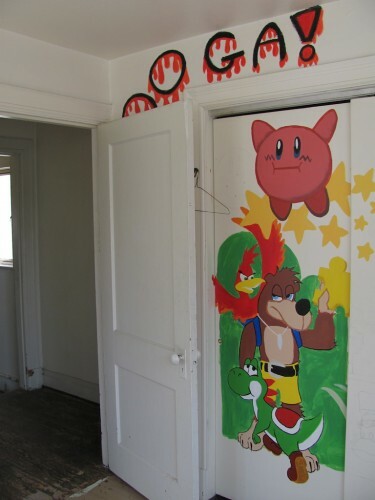 There were ruddy crosses finger-painted above every bedroom door. Non-positive vibe. My agent had hand sanitizer in the car. 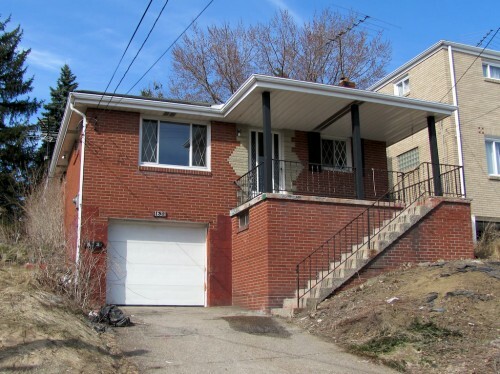 Interesting-enough, small two-bedroom in Greenfield. Very narrow house, obviously had spent most of its recent years as a student rental, awesome kitchen flooring. Unfortunate three-bedroom in Greenfield. In kind of a weird part of the neighborhood and walking from its front to back made me seasick with all the variations in, like, flatness. OTOH, the toilet worked. The house in Lincoln Place on which I’m making an offer. Another slant-floored house in Lincoln Place. 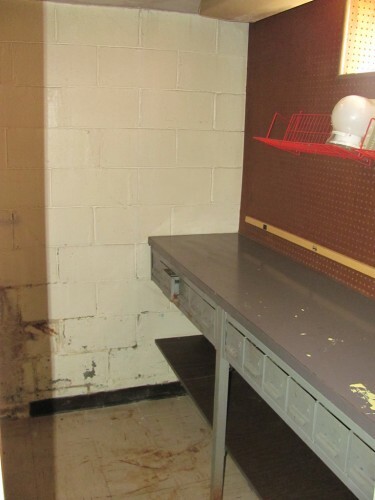 The “kitchen” and “bathroom” were both located in the basement for some reason. The shame of it is that the artist didn't sign his (her?) work. You can't *really* tell, but the wallpaper in this one is reflective silver. Would have worked great in East Germany. 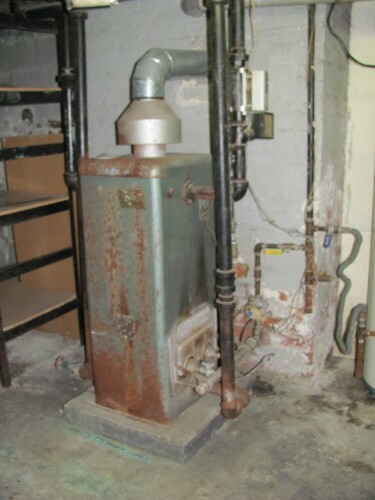 A boiler! My agent said it needed to be replaced (by a NEW boiler!). And unfortunately we didn’t not come into contact with any of what he called “octopus furnaces”. 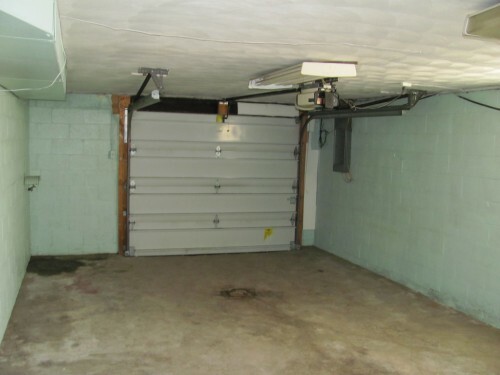 Needs a new garage door. 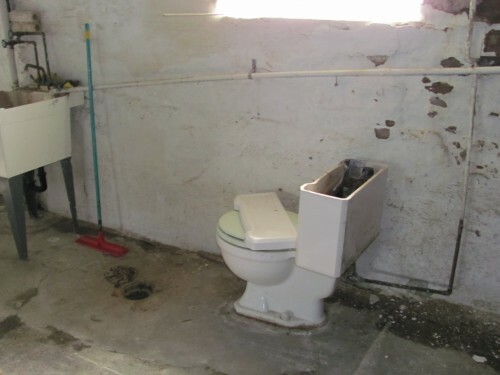 This is a real, functioning toilet that’s in the middle of the basement floor (or off to the side, I guess). Apparently this is a thing here in the Burgh — it’s actually called a “Pittsburgh toilet”. According to legend, the steel mill worker would come home covered in soot and slag, enter through the side door, then head to the basement to… well, take a crap I guess. There was probably once a shower head down here next to the toilet, which may have helped with the soot. And no walls. Basement toilet stall walls are gauche. Or they were 100 years ago. Spent today looking at houses in the Pitt. It’s different here. For one thing, any house that seems too inexpensive for its specs is usually that way because the floors all slant different directions. I was in three houses today where — yeah. Felt like standing on a ship’s deck. Front Elevation. I suppose I'd have to put shutters on the left window. The kitchen; I like the floor-to-ceiling tile. Makes it look like an operating room where they perform unnecessary surgeries. A bedroom. They all looked about like this. And I didn't take a picture of the living room for some reason. 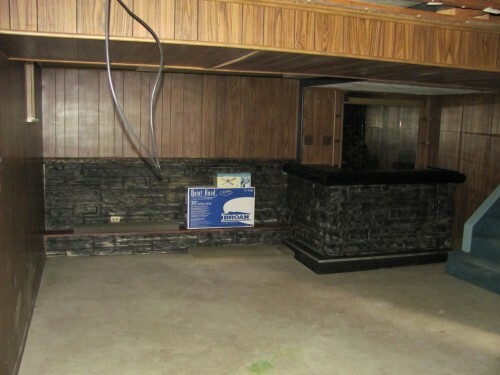 Which is a shame, because someone had painted a fireplace on one of the living room walls. 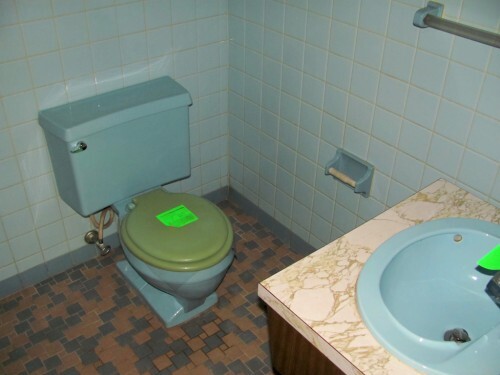 It almost fools you in the listing photo. Rec Room. The bar is wet. The downstairs bathroom. 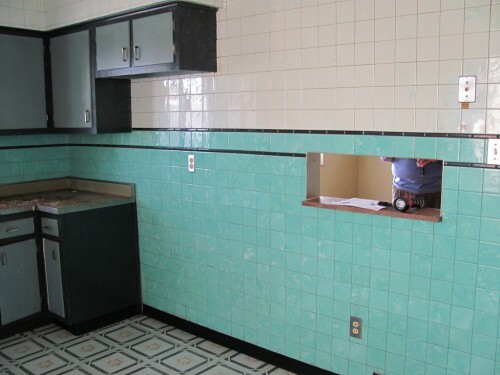 I kind of like the retro -- which is good, b/c my real estate agent told me not to mess with the tile in this one. OTOH, he told me I *did* need to mess with the one upstairs. The one upstairs looks pretty much the same as this one, only it’s pink for some reason. The workshop. Seriously, the house has a workshop in it. Rocks. 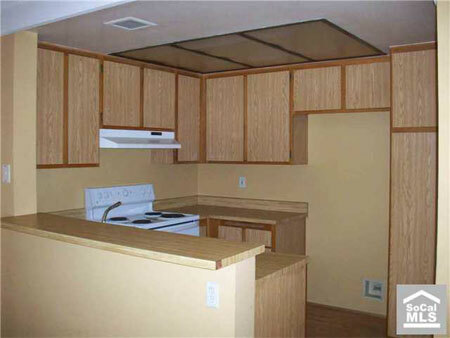 New kitchen (floors, walls, cabinets, appliances). Wood floors re-finished (sanded, re-stained). Jury-rigged basement A/C unit replaced. New carpet in basement and on stairs. Paint on outside railing and stairs. Otherwise, good to go. With the price I’m hoping to get it for and what it should be worth fixed up, this should be a really good deal. If you’re looking for something over on the West Coast, I’ve heard good things about the River Island development near San Francisco. Also, my real estate agent does not displease me. He gets what I’m trying to do here and has enough experience with house flipping that I trust his advice. Or, if it’s all just an act on his part, *really* well played. Just found out from my landlady that the house across the street (in front of which I park, if available) belongs to the beloved actor Robert Englund. Here’s hoping he doesn’t have me towed. That would be a true nightmare on *my* street (har). They’re not really scenes, I guess. Just photos. With a bunch of stuff in them because I haven’t really unpacked yet — still debating whether it makes sense to unpack, for one thing. The new living room. The place comes furnished, btw. It’s nice, eclectic stuff. 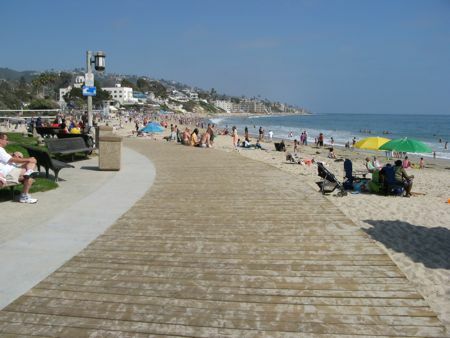 The boardwalk at Main Beach in Laguna. This photo is about a mile down from where I’m living — but there’s another beach that’s just three blocks and across PCH away from me (5 minutes walk). It’s really small. Most of my stuff is in storage already, but not enough of it apparently. No garbage disposal or dishwasher. The recycling bin is bigger than the main trash can. Backing out of the driveway is tricky (it slopes down toward the house and it’s kind of a blind back-out situation as a result). Town is crowded on the weekends. More per capita Ferarris than any other city on Earth. Everyone warned me about the traffic before moving here. But “everyone” hasn’t lived here — they’ve just experienced traffic trying to get here on a weekend, which I’m sure was brutal. But when you’re starting with your car already in Laguna Beach, it’s not quite so awful. Driving to work is 25 minutes now, but not that much traffic on the way and it’s pretty free-flowing. 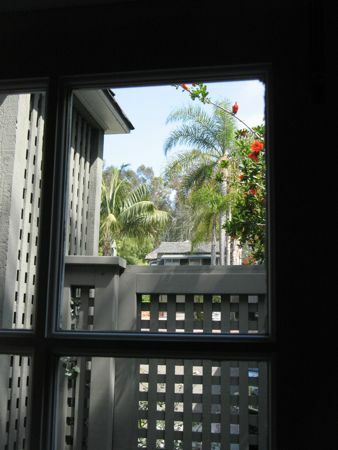 Due to a specific and herewith unnamed set of circumstances, I’m moving (again) next weekend, this time to Laguna Beach. The new place is about a three-minute downhill walk to the beach and is close to downtown Laguna, where there’s supposedly a “scene” and “stuff to do”. Which may make it somewhat unlike Mission Viejo. 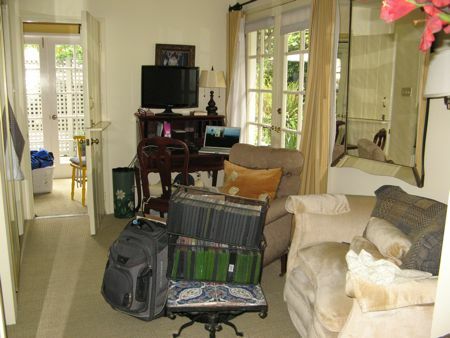 The apartment is smaller than the one I had in Manhattan and comes furnished and with weekly maid service. It’s basically a vacation rental that I’m renting longer-term. Further updates as events warrant. My old kitchen in all its glory (except that it’s yellow now). Asking price is only $100K less than I sold it for in 2004. Ouch. 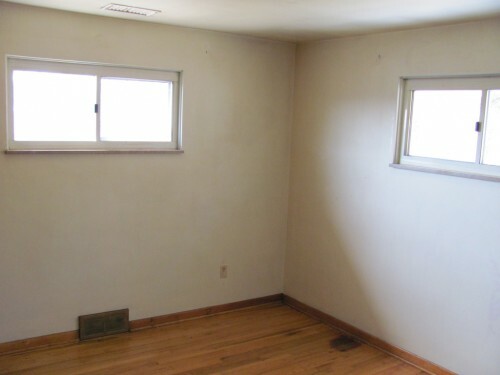 From the signs on the windows in the photos on the Redfin listing, I’m guessing it’s also been through foreclosure and auction. Looks the exact same as I left it though — except for the new wood floors and fresh paint. Kind of sad, yet kind of reminds me that it wasn’t really that nice of a place to begin with. I still have strong recollections of the upstairs neighbors inviting their large extended family over so all the kids could race from one end of the (wood-floored) unit to the other while I was trying to work downstairs. Again, ouch. The odd thing about looking at the below list of moves is that it leaves me realizing how many places I *haven’t* lived and makes me feel like I’m probably missing out on a lot of residence-oriented experiences. And that I should maybe try out some more options. Because it’s like having $1,150 a month cash drop from the ceiling. Plus the old place was gated (don’t get me started), had sub-competent gate guards, too many speed bumps, old people who stared at you from their windows but never came outside, had some weird tiles (well it did), and sound carried way too well across the lake. 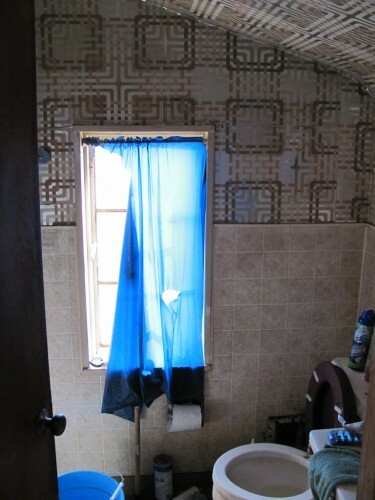 And the bathroom was carpeted. Because the new place only cost 30% more despite being twice as big, having twice as many bedrooms, and having a pretty nice view of the lake. And the old place was pretty scrappy. And gated. With speed bumps and too-narrow parking spaces. Because I got the job in California and didn’t really ever quite adapt to life in the Big City, in no small part because of the outrageous expense and constantly having to walk through the snow/wind/sleet/rain to get to/from the subway station. ‘Course, I think if I’d carried more accurate expectations into the job, found a roommate out in NYC (or thereabouts) to cut down on the cost of rent, and/or there’d been a few more people in the End Point offices, I might have stuck it out for another year. Because I wanted to buy a house, thought that I knew a lot of people in Utah that I could hang out with, and because working at Epson seemed to have run its course and if I was going to start a business, Utah was an easier/cheaper environment for that. Because I started business school at UCI in 2000. Went back to the studio’s neighborhood over Christmas and drove around — it was kind of a cool area, I think. Because the studio on the lake was pretty cool and its owner was a friend from work who really wanted me to move in there. And the Mellmanor place was a pretty funky apartment — seemed more like a hotel, but without any elevators or lighting in the hallways. Althought it was the site of the Miracle of the Fish that I should probably chronicle some day. It made for a good church talk. Because after a couple months of living in your brother’s house it’s hard to feel like you’re doing a good job of maintaining your dignity, let alone advancing it. Sadly. Because I’m not a farmer and I’d heard the job market in San Diego was promising. Because I was working in Twin by that point, so it didn’t make a whole lot of sense to still be living in Rupert. Because after arriving in Boston to pursue my masters, I realized that the degree I was going after would probably over-qualify me for any sort of meaningful job, plus the other kids in the program were not quite as brilliant as I was hoping they’d be (“Utah’s one of those Great Lakes states, like by Michigan, right?”). Because I was starting a masters program in writing and publishing at Emerson and, really, it was high-time to get out of Provo. So I’m not sure what would be next anyway. I’m thinking maybe I ought to buy a house or some property somewhere, call that home base, then just keep on living cheap wherever I end up finding work. Or else living out of my truck. Man — that just seems so romantic. Oh well. Mal sehen was wird. And I’m now really tired of carrying stuff. Big thx out to DLF and DDF/DLF-Prime (whatever she’s going by these days). It was, actually, better than being at work for the last three days. Huh. And as a result of the move $1,150 cash will be falling from the ceiling of my new bedroom every month. So cool. Those stupid, giant birds and the crab carcasses they’d always vomit onto my deck. Ugh. I’ll post a picture one day. Of the birds, not the carcasses. Sadly. The tiles in the entry way and the chandelier. The sound of sirens echoing off the lake. The lake’s Summer Jazz Festival. The gate guards — they had a greater than 50% failure rate at letting my guests in. The old people who would sit in their living rooms watching — although it did make me a little nostalgic for East Germany. The stunning lack of cash falling from ceilings.